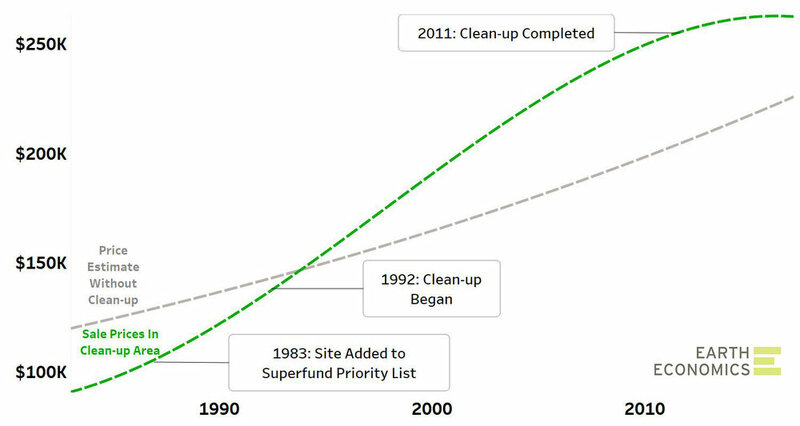 What’s the value of an Environmental Protection Agency (EPA) Superfund cleanup? In collaboration with the Washington Environmental Council, The Nature Conservancy, The River Network, and Resource Media, Earth Economics conducted an economic analysis of the communitywide benefits of EPA cleanups in Washington state. As one case study, we examined the Ruston Superfund site – where for nearly one hundred years a copper smelter emitted a toxic plume of heavy metals from Everett to Olympia. The research team estimated the impacts to property values for homes that were remediated using funds awarded by the EPA’s litigation of ASARCO, the smelter operator. These benefits amounted to an average increase of nearly $53,000 per home following cleanup, with a neighborhood-wide benefit of more than $52 million in residential property values. The graph below illustrates this added value with the green line, while the gray line shows where home values would have remained without cleanup. In addition, the cleanup spurred investment in a $1 billion mixed-use development at the former smelter site as well as myriad unmeasured public health benefits that resulted from the removal of lead and arsenic from residential soils. For more information on cleanup impacts, check out the full fact sheet, The Economic Benefits of the EPA-led Cleanup in Ruston, Washington. Communities around the state benefit from investments made through EPA funding. Environmental investments are economic investments. As we head into the final budget deadline of January 19th, we are asking Washington citizens to make your voices heard, using letters, calls, and social media to call on the Administration and our Members of Congress (Senators Maria Cantwell and Patty Murray, and your U.S. House Representative). ● Use social media to call on leaders to #SaveEPA. Upload a photo, draft a short message and use the #SaveEPA hashtag. Here is a sample tweet: @PattyMurray Washingtonians ask you to keep raising our voice for #PugetSound! Keep fighting for a strong budget to #saveEPA!